OzBargain is now 9 years old. We will be having our annual competition next week. More details will be revealed shortly but the plus is there is no need to do anything creative. As you are aware, Tightarse is now working at Cashrewards. 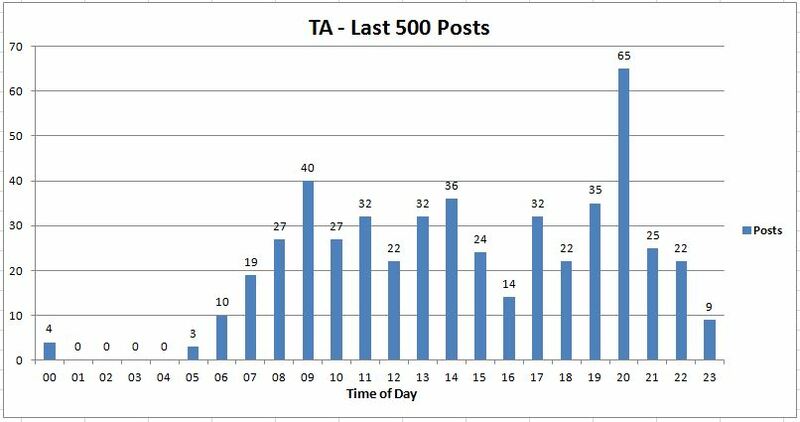 In the spirit of stats, user sysplex has created a graph on the time of day Tightarse has posted deals. As requested from last month, we have a new stat called controversial comments. Quite interesting. Things OzBargainers find controversial: Caged eggs, bicyclists, driving infractions, and religion. Add warning about no negotiated deals if store is rep-banned. Add competition front page notifications. Added links to mark comps as entered directly from Not Entered page. mikec for posting the deal of the month, eBay Click & Collect at Woolworths/Big W. eBay deals again won the top spot last month. In fact 3 of the top 10 deals from October were eBay offers (25% off Target coming 5th and 20% off The Good Guys 10th). November is going to be one big month for eBay — looking forward to more deals. JSQUARED for posting the competition of the month, Win $250 AirBNB vouchers from Westpac. It's the top competition that was not posted by an OzBargain staff (1st being hamza23's Win a Mazda CX-5). However it might be JSQUARED's last comp award, as of this month he is starting his part-time employment with OzBargain continuing his work on moderation & other future projects. Congratulations! tightarse for being generally awesome again last month. 85 deals, average +110 votes, 80 of them got onto the front page, most popular being Cashrewards' eBay 4% cashback negotiated deal that got onto the front page in 6 minutes 51 seconds and also secured him a job at Cashrewards. Congratulations! He is real active member of the community and is always fast at responding to comments on his deals, competitions and forum posts… The amount of time and effort he goes into on a monthly basis is astounding and his continued generosity, positiveness he brings to this community is inspiring. He is one of the reasons I check this site countless times a day! Congratulations to all the winners! If you would like to nominate another member, please either PM me or put it in the comments below. Overall traffic: 8,106,627 sessions, 24,629,299 pageviews. || September 2015: 7,975,663 sessions, 24,343,337 pageviews. || October 2014: 7,196,913 sessions, 22,228,565 pageviews. Very glad Eneloops made it to the "Top 10 Search Alerts"
I always find it interesting to see how big of a gap there is for the views of individual store pages, especially dominos who are miles ahead. Is it worth asking how Ozvoucher is doing? Is it all clicks from Ozbargain or is it becoming independent a bit more now? Retailmenot has usually been my no.1 for vouchers but ozvoucher has been incredibly handy lately. Yer fair enough. I think for the most part it's design is fine. Shows the code and what discount it provides. Simple really. Controversial comments gave me a much needed chuckle. Trolls come for the bargains and stay for the odd chance of a joke. It's fun. OK, I think I ran this query right however there were only 4 comments for October that met these specifications. I must be the most responsive Store Rep on Ozb. I'll catch up to JV on comments soon too. Christmas holidays are coming up. That's how soon. How did you create the graph? i suspect you can get the time of each post from the RSS feed for each user and then just plot a graph i guess. "neil on 02/11/2015 - 19:06 bmag.com.au"
…put them into Excel and massage. what was tightarses previous job that let him post a deal every 2 minutes during work hours? But looking at the spread of his posts, it would seem he works in IT/government job/part time/retired/unemployed, most jobs its rare to have so much free time every hour. Actually, I think you've got it totally wrong! "He" is a she, a housewife in fact. Let's start at 5am - rise and post until 7ish. Get the kids up ready for school. Drop off kids at school - back home at 9am - post, post, post! Take some timeout for lunch around 12 noon. More post, post, post until 3:30 - gotta get the kids from school. Back home after school - kids in front of the TV - post, post, post. Hubby home soon, dinner prep starts at 6pm. Dinner over, kids to bed by 8pm. Post, post, post, post, post until 10pm. Decline in posts as busy day takes its toll. Lights out around midnight. ZZZ. Deep sleep settles in. ZZZ. Dreaming of bargains never stops. ZZZ. Monthly awards. ZZZ. Mega deals. Coupons. ZZZ. BUZZZZZZZZZZZ - it's 5am! @sysplex: lawl! TA won't be happy with this description though. @sysplex: Are you sure ;) I up voted your post, but someone has negged! I'm very disappointed that I did not make the top 10 negatively voted comments (as members regularly love giving me negatives)… Better luck next month!